Designed for waterproofing basements, tanks and ducts, both internally and externally on concrete, brickwork and blockwork. PermaSEAL Tanking Slurry is a single pack cement-based coating, consisting of Portland Cements, blended and formulated with quality graded aggregates and chemical modifiers. 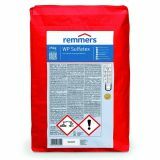 It is ideal for tanking cellars and basements, keeping them dry by effectively blocking water ingress. It is easy to use - you can apply it directly onto damp substrates with a brush. In addition, PermaSEAL Tanking Slurry contains an acrylic polymer that imparts improved strength, bonding and abrasion resistance. 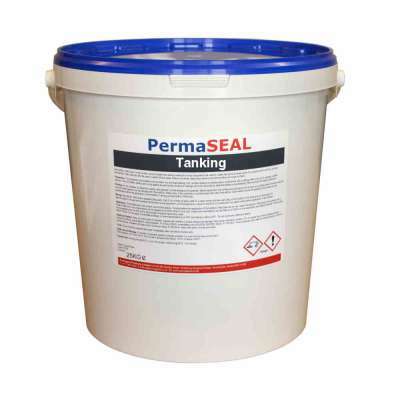 After hardening, PermaSEAL tanking becomes a vapour permeable and watertight coating capable of withstanding water pressure. PermaSEAL cementitious tanking is mixed with water on site and applied directly to the surface by brush. It is safe to apply on damp substrates. It is specially formulated to enable excellent adhesion to construction surfaces. Our tanking slurry is available in two colours, white and grey. As a general guide, use one colour for the first coat then the other for the second coat which makes it easier to see if you have completely covered the surface. PermaSEAL Tanking should always be covered by a minimum of a 10mm coat of 4:1 sand and cement render, a 1:1:6 Lime based render or PermaSEAL Renovating Plaster. After this render coat has been applied, dot and dab plaster board, multi finish or a breathable paint can be applied. Note: all tanking products are prone to sweating during the drying out phase and if left exposed after the product has cured. We suggest they are always covered as above and/or adequate ventilation is installed to manage the humidity. For more information, read our guide on tanking a cellar or waterproofing a garage with tanking slurry. Great tanking system, easy application and good value for money in comparison with others available on web. Really pleased with this product. Does exactly what it says. I used the coating on the brickwork in my basement, it was easy to apply making the job as quick and easy as possible. I would definitely use this product again. Can PermaSEAL Tanking Slurry be applied to painted cellar walls? No, PermaSEAL Tanking Slurry must be applied to the clean masonry substrate. All paint and previous coatings must be removed and the masonry substrate made good before the tanking slurry can be applied. Can PermaSEAL Tanking Slurry be applied on breeze block walls? Yes however you must apply a thin render to the block first to fill any air holes or indentations so the tanking can create a waterproof seal. If this is not applied air holes can form through the tanking slurry allowing water to pass through the coating. Can PermaSEAL Tanking Slurry be applied over old bitumen? No, it needs to be applied to a sound clean masonry background. If you cannot remove the bitumen we suggest the use of Multi Tight 2K as this will adhere to sound bitumen on floors and walls.